Even the best factory infotainment system is a heavy piece of techno-vanilla designed to inflate a car's sticker price and already bloated waistline. I look forward to the day we'll replace it with something better. Sadly, the iPad isn't it. The concept of being able to swap in your own, custom computer system is the right one. Imagine buying the cheapest, most stripped-down version of a car and still having all the information and entertainment you need and want. The OEM version of customization is letting us choose what garish version of blue we want for the backlighting. A small portable device frees the user to create exactly what he or she wants. Paying hundreds or thousands of dollars for a stock system is ridiculous when you can just plug in your 3G-equipped device and stream music, get route guidance, pull up information, use apps like Trapster, and talk to a vehicle's onboard diagnostic system. And the best part for enthusiasts of a tablet-style system isn't the connectability — it's the disconnectability. If I want a tech-free drive, I can just leave my tablet in my bag — or take it from one car to the next. OEM systems are always there, always lurking, always taking up space. I wanted the iPad to be the Jesus tablet, healing the sick control stacks and feeding the poor dashboards with information. It's not. It fails in a number of fundamental ways as a replacement for the infotainment systems we have today. 1. It Can't Multi-task The iPad has been compared to a big iPad touch, which means if I want to use GPS to lead me on my journey, listen to Slacker Radio through the 3G connection, and track my car's diagnostics I have to stop, switch apps, and start over. That's not gonna work for me. 2. It doesn't make calls — probably As much as I'd like to believe no one makes phone calls in their cars, the reality is it happens all the time. Even I do it. Right now the iPad — as announced (there's some question as to whether the SDK, which allows for app development for calling capability on 3G-equipped models, will allow that function on the iPad) — doesn't accept calls so it's on my own to develop a system to have the iPad work as a phone (one even worse — an iPhone) with the phone in my pocket. Even the most basic modern infotainment systems can handle a phone call. 3. No Voice Control — probably The most important factor with any in-car multi media interface is the ability to control the system without taking your hands off the wheel or your eyes off the road. Systems like Ford's SYNC and Audi's MMI, using voice or steering wheel control, have managed to automate numerous commands. Using the iPad out-of-the-box as a solution is wildly dangerous (unless voice control present in the SDK is allowed when it reaches the iPad), even with the big screen, because it's designed to be stared at and played with and not used autonomously. 4. Super Monkey Ball As much as I'd like to use it to layer custom maps and monitor my car's performance it's just as likely to be used by an inattentive teen sitting in their V6 Mustang about to ram into me because they're playing Super Monkey Ball or reading a blog. Like the iPhone, it's too good at things — like reading books — you should never do as a driver in a car. All of this doesn't mean the iPad has no place in the car. It makes a very plausible rear-seat entertainment system and one much cheaper than the $1,995 they charge for a headrest DVD player in a new Toyota Sienna. Imagine spending just $499 per device for your kids loaded up with enough episodes of Dora The Explorer to keep their mouths shut through all of Western Canada. I was all ready when the iPad super debut geek techsplosion occurred to write about how this thing was going to end up in every car but I couldn't. 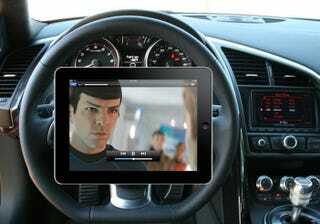 Will someone put an iPad in a car? Totally. It just sure as hell won't be my car. UPDATE: An iPad as an owners manual? Our old friend Matthew Debord thanks so.